Public transportation without safety measures like vehicle tracking devices and emergency response system in public transport are creating nightmare for women passengers to travel. A further delay in implementing such measures will only aggravate the current situation of public transport in India. On 28th November 2016, Ministry of Road Transport and Highways (MoRTH), Govt. of India, had mandated fitment of vehicle location tracking device and one or more emergency button(s) in all public service vehicles with effect from 1st April 2018. 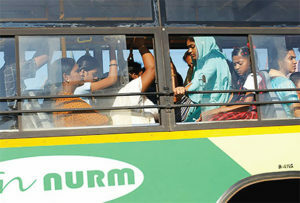 The regulation focused on women safety in public service vehicles such as buses and taxis. The action was also an outcome of Justice Verma’s Committee report which recommended that all transport vehicles should be fitted with tamperproof GPS tracking system. Recently MoRTH released a notification mentioning that the Central Government has exempted all public service vehicles from the provisions of rule 125H of the Central Motor Vehicles Rules, 1989 (of equipped with or fitted with vehicle location tracking device and one or more emergency buttons) upto the 1st day of April, 2019. This delay will hamper the primary motive of the regulation. Working women population in India is ~44 million, out of these, 30% do not undertake any mode of transport to travel for work and 39% travel less than 5 km citing unsafe public transportation as the reason. ~88% women feel unsafe while using public transportation. There were 315 cases of “insult to modesty of women” (under section 509 of the Indian Penal Code) in public transport reported in 2015, an increase of 160% over 2014. By 2017, 436 more such cases were reported. Public transportation without safety measures like vehicle tracking devices and emergency response system in buses and taxis are creating nightmare for women passengers to travel. 87% passengers feel emergency response does not come even after dialing the emergency number such as police and ambulance; this also attributes to the quality of devices being used at present and lack of standards to govern any such system. The notification released by MoRTH in Nov, 2016 have also triggered development of robust automotive industry standard (AIS-140) which will ensure quality and reliability of devices/ systems used in case of emergency. After Nirbhaya incident, government had formed the Justice Verma Committee to decide course of action to address women’s safety in public transportation. Government announced Nirbhaya fund for safety and security of women but even after 7 years nothing has been implemented on ground to protect women in public transportation. Government has taken steps against criminals involved in women and girl child abuse by giving them capital punishment but no preventive measures have been taken by the concerned government authorities to ensure safety and security of women citizen. The similar sentiments have been expressed by Raahat – The Safe Community Foundation in a letter to the President and Prime Ministry of India. Recent announcement by MoRTH to delay the implementation of AIS-140 driven regulation by one year will put us in a situation as similar to EUROPE’s e-Call implementation (e-call regulation in Europe was finalized in 2015 and came under implementation only in April 2018). India has the right ecosystem in place to expedite any such important initiative. Delay in implementing such measures will further aggravate the current situation of public transport in India. Notification released by MoRTH in November, 2016 had given sufficient time to the ecosystem for large-scale implementation. After the reaffirmation from the Ministry on 17th Jan 2018 (through a tweet), entire supply chain has geared up in order to comply with the regulation. Thousands of vehicles registered from 1st April till 20th April with AIS-140 compliant solution and are running on the roads. During these first 20 days of April, industry had already started ramping up the capacities and inventory got build up. The losses runs into several crores. Various SMEs (Small and Medium Scale Enterprises) from device circuit designing, casing, wiring harness, packaging and panic button manufacturing are involved, which are supplying raw materials to product companies for manufacturing these systems. The Industry expected demand of ~4.4 million public service vehicles (including buses and taxis) by end of FY19. Suppliers have already committed to huge investments in terms of money, manpower and building technological infrastructure for developing the regulation compliant product. As per the national testing agencies (i.e. ARAI and iCAT), there are more than ten AIS-140 compliant solution (VTS+ Emergency Button) providers who have successfully obtained homologation certification. Large scale implementation within stipulated timeline across India required industry to be ready with sufficient manpower for avoiding the “demand supply gap” as well as providing the after sales support. The on time implementation of “Indigenously developed AIS-140 compliant devices could have marked a huge success for “Make in India” initiative too. Regulation has created humongous job opportunities for skilled as well non-skilled workers because of scale of the implementation. It involves, manufacturing of hardware components like vehicle tracking device (components as – embedded SIM, PCB, casing), wiring harness, panic button, etc. backed by software framework support such as – cloud services, communication protocols, data centre, etc. which are creating employment for skilled workforce. This also needs on ground support to do the fitment of devices in vehicles and after sales support. Deferring the implementation will result into cost cutting measures from industry thus resulting in loss of Jobs. It is proposed to launch the initiative in phased manner. The compliance could begin in states like Delhi & Kerala who have the backend infrastructure ready. The systems could then be deployed in phased manner in various states considering the availability of the vendors providing the backend services. The sates like Maharashtra, Gujarat and Tamil Nadu where working women population is very high can start implementation in phase 2 and followed by Karnataka, Andhra Pradesh and Telangana etc. The solution can rely on the vendors who are providing the device to the states and can provide the backend infrastructure as a service, as a stop-gap arrangement. In the event, when panic button is pressed signal can be sent to the police control room of the state to take necessary actions. Thus, ensuring the safety of the passengers in distress. The service providers can help in the transition till states are ready with their emergency response infrastructure.